This past few weeks I've been designing and creating all the table decorations for the upcoming dinner party and it's slowly but surely coming together. I feel like I've taken a big step forward today by finishing the napkin ring design but its been such a busy day that I haven't been able to photograph the step by steps yet so look out for that later on. I've used one of my favourite jewellery making supplies to create these: silver filigree stampings. I love how versatile brass stampings are; I use them in lots of different ways and I've even blogged about that here. 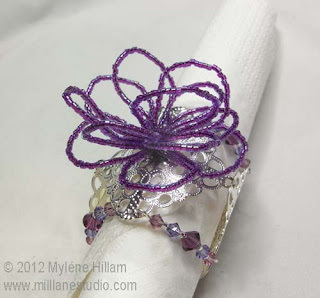 For this project I've used them to form the napkin ring base, with Preciosa and Swarovski crystals to connect them together. The focal point is a Delica flower. It was a bit tricky to photograph the flower so that it didn't just look like a tangled mess of wire but in real life, it looks delicate and pretty - this definitely says "Myléne". Of course, I now have my work cut out for me and I have a dozen more to make so I'd better get cracking.